According to police spokesperson Lt-Col Brenda Muridili, the security company's drivers had just collected cash when they came under fire. Bystanders stole money spilt from a blown-up van in Tembisa on Monday evening. Police have warned that anyone in possession of the cash could be charged as an accomplice to armed robbery. "As they were leaving they heard gunshots and their vehicle was shot at. The vehicle came to a standstill. That's when one of the crew came out. 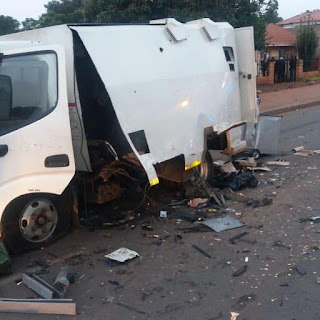 He was disarmed, and allegedly the suspects blew up the cash van and got away with an undisclosed amount of cash and the pistol of one of the occupants of the van," she said.